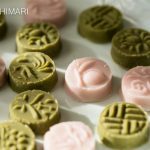 Matcha Green Tea and Omija Cookies are wonderfully healthy no bake Korean cookies that are so elegant, beautiful and traditional. These delicate cookies are made with fine Matcha powder and Omija tea sweetened with honey. Korean nobility enjoyed these sweets as snacks during their tea time. In a bowl, add white rice flour, powdered sugar, salt, Matcha powder, honey and water. Mix well with a spatula until evenly coated. Once lumps start to form in the dough, gather dough with your hand and form into a ball. Cover with plastic wrap and set aside until ready to use in the Dasik mold. If making Omija cookies, soak 1 Tbs of dried Omija berries in 2 Tbs of hot water. Let it soak for several hours or overnight in the fridge until color of liquid becomes deep red. In a bowl, add white rice flour, powdered sugar, honey and Omija tea. Mix well with a spatula. Once the omija tea dough start to clump together, gather it with your hand and form into a ball. If you don't have a Dasik mold, you can easily use PieCrust Cutters. Lightly coat your work surface with sesame oil then either roll out the dough or just flatten with your fingers. Make it quite thick so it doesn't break. Then press the cutter into the rolled out dough and cut shapes out. Raise Dasik mold frame and fill the mold with green tea or omija dough. Press down evenly and fill the mold completely. When filled, press the mold frame down to expose the dasik cookies. Gently pick up each cookie from the mold. See my video for details. Adjust water or liquid amount. Add more or less depending on how dry your flour is and how dry or humid your climate is. In my recipes, I’ve mostly used white rice flour as the base but you can also use roasted soybean flour, mung bean flour, corn starch and even regular flour. Use light colored honey so you don’t muddy up the colors. These cookies dry up pretty quickly so store them in airtight containers in the fridge. Should be good for few days. Substitute Hibiscus tea for Omija (Five Flavor Berry) tea if you cannot find it. Hibiscus tea has similar flavor and color. These tea cookies dry up easily because there’s no oil. You can always add a bit of water or tea to add moisture back in. Coat the cookies with sesame oil to prevent drying up too quickly.